Free Yo Self: Were we moving across the country? No, just headed to NOLA for four days. Renting baby gear would have cut this load in half. If there’s one common gripe among American parents, it’s the stuff. No matter how much we try to minimize, the IKEA bins (we bought) and Pottery Barn baskets (we registered for) seem to overflow with toys, bottles, clothes, and, hopefully somewhere in there, my lost car keys. Ready for some good news? 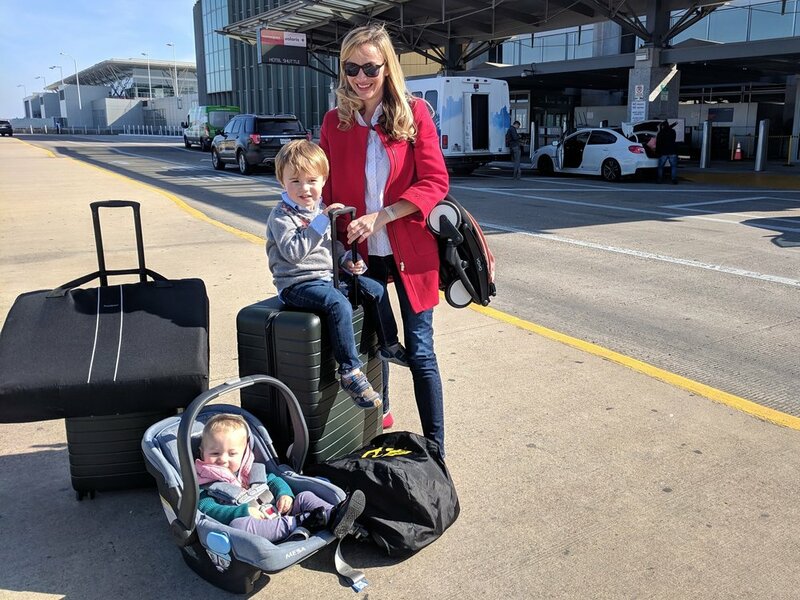 Loads of destinations benefit from baby and kid equipment rentals services that carry everything from cribs and pack n’ plays to high chairs and changing tables. Here are three that service cities and destinations across the U.S. and Puerto Rico. Have you used a great rental service? Tell us about your experience in the comments section below. The most comprehensive equipment rental site—and easiest to use—is BabyQuip (formerly Babierge). Based on the sharing economy model, this company vets and works with customer-reviewed equipment providers (often parents) in areas all over the U.S., Puerto Rico, and a few cities in Canada. Rentals and services depend on the individual provider, though you can usually hire her to deliver anything from cribs and toys to high chairs and even groceries. If your destination is somewhat remote, BabyQuip is also your best option as geographic rental boundaries are set by the individual renter, not the company. A friend traveling to Roanoke, Virginia found someone who would deliver from Charlottesville, two hours away—for a hefty (but negotiable!) rental fee. Baby’s Away has 80 rental locations in the U.S. The company buys its gear directly from equipment providers, and supplements their collections from places like Amazon or Wal-Mart on a case by case basis. Providers will deliver to residences, hotels, and airports within set geographic ranges, usually cities and their surrounding suburbs. Like Baby’s Away, this company’s equipment is sourced, cleaned and stored in dedicated warehouses when not in use. In some cases you can pick-up rentals directly from the facility, or arrange a hotel, house, or airport drop-off. Can’t find a nation-wide company that serves your area? It’s worth doing a quick search for local companies, of which there are hundreds. Have a favorite company I missed, in the U.S. or abroad? Include it in the comments below. Bring youR Backpack on the Plane! Backpacks are the perfect airplane carry-on for kids. Here are three we love from around the world. This backpack is made by a Swedish designer named Fjällräven. (Try saying that three times fast!) It comes in cool colors like emerald and sunflower yellow, and its fabric is made of recycled plastic bottles! Headed on a camping trip? This bag comes from the U.S.A. and fits everything from your notebook to your canteen. It’s also made from recycled materials, and since Patagonia believes in reusing things as much as possible, it will fix a broken zipper—or anything else—without costing mom or dad a dime. You’ll find a pocket for your pencils, plane games, your favorite stuffed animal and more in this fun backpack. It’s designed in London but modeled after school bags that are popular in Japan.